We received this in the mail and thought we should share it in case people think that the issue of Paulette Chaffee’s pilfering and FPD’s obvious conflict of interest isn’t be followed up in every possible way. 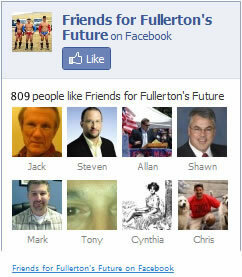 My name is Tony Bushala, a resident of Fullerton. I would like to request an investigation by the District Attorney regarding the theft of campaign signs paid for by my political action committee. Please refer this matter to your Special Prosecutions Unit. In the past few weeks, l have had hundreds of campaign signs stolen. These signs cost a considerable amount of money to design, print, fabricate and place. On the night of October 2, 2018 video security cameras at my property at 110 E. Walnut Avenue in Fullerton, caught a suspect identified as Paulette Marshall Chaffee, a Candidate for the Fullerton City Council, Stealing a campaign sign. The following afternoon Ms. Marshall Chaffee was recorded stealing a campaign sign I had Placed on the Union Pacific bridge over Harbor Boulevard, also in Fullerton. 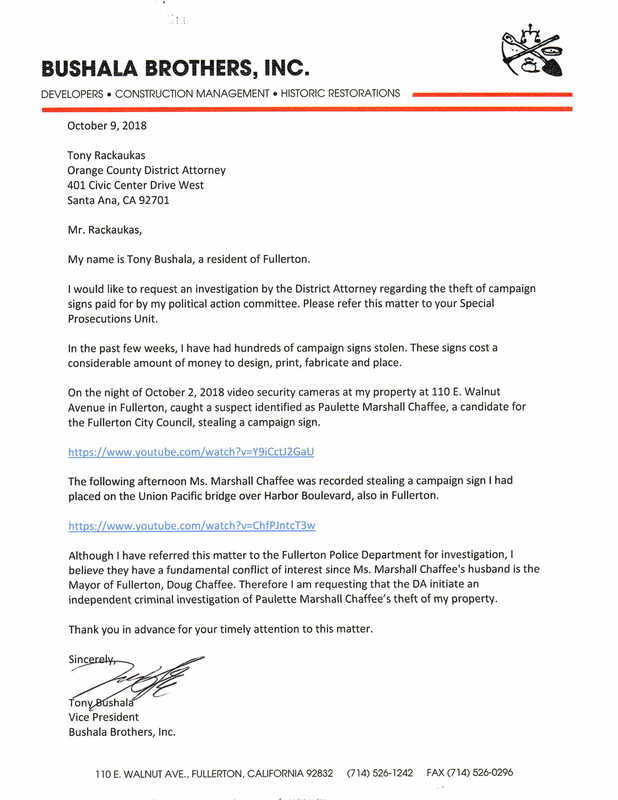 Although l have referred this matter to the Fullerton Police Department for investigation, I believe they have a fundamental conflict of interest since Ms Marshall Chaffee’s husband is the Mayor of Fullerton, Doug Chaffee. Therefore I am requesting that the DA initiate an independent criminal Investigation of Paulette Marshall Chaffee′s theft of my property. Thank you in advance for your timely attention to this matter. There it is. Just do the right thing. Rackaukas? Well, I guess there’s a first time for everything. Please don’t expect to much from T-Rack. I doubt he would touch this 30 days out of the election of his life. After all why would he piss-offhalf of his county wide votes by going after a Democrat criminal like Paulette Chaffee?! I think all of the signs you disagreee with are fair game now, just take them down and put them in your car like Paulette Chaffee does. I’ve already seen less of Doug’s around actually.